humates, fulvic acid and organic carbon. Nourishes plants for strong, healthy growth. 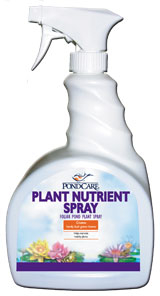 Promotes larger and brighter blooms of water lilies and all flowering pond plants. Encourages development of healthy leaves, stems and roots. Promotes healthy and lush foliage. Safe for use in ponds containing fish.